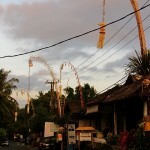 The Balinese gods are visiting. 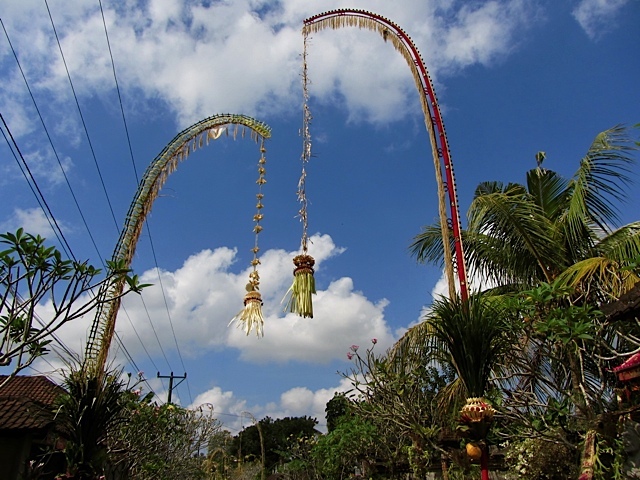 Every 210 days the Balinese gods visit Earth and leave 10 days later on Kuningan, the last day of the holiday. 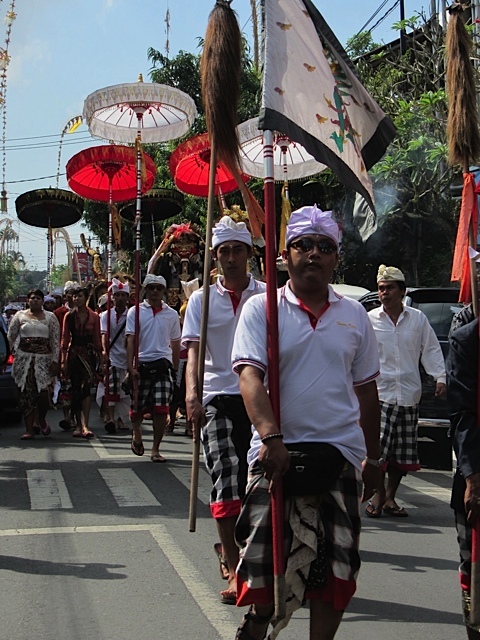 Galungan begins one of the most important religious ceremonies in Bali. 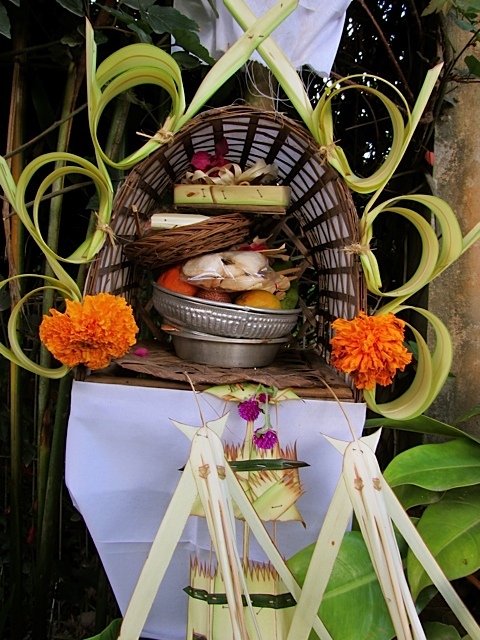 Balinese Hindus honor the creator of the universe and the spirits of their ancestors. Business stops and schools close. It feels like Christmas, only Hindu. 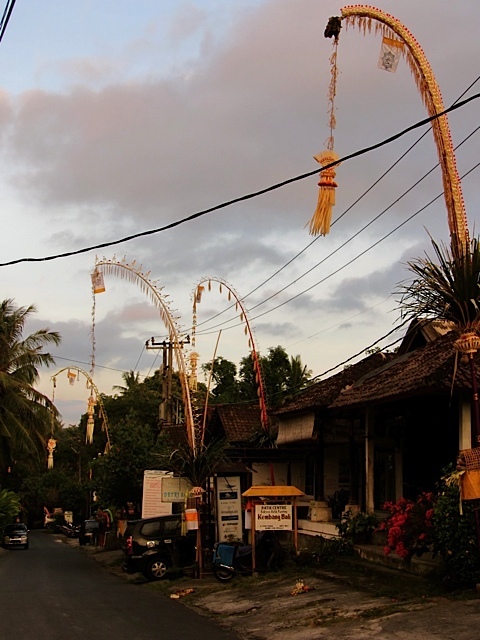 The town is decorated with thousands of penjors, a welcome symbol for the gods and ancestors. 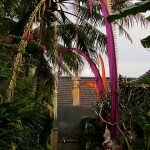 The tall bamboo poles are splendidly adorned with woven palm leaves, ribbon and flowers. People have been working on them for days and each one is different. 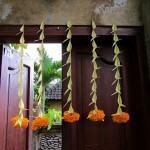 They’re made of simple, natural materials, but just like the Balinese, they have a royal presence. 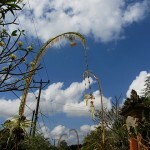 The penjors sway in the wind. 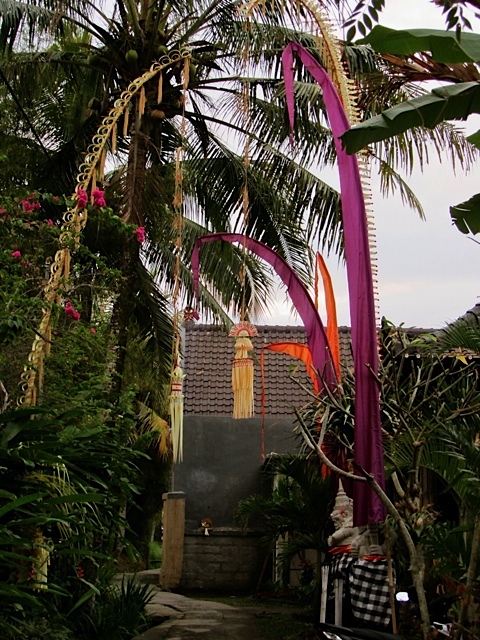 They reach up to the sky while being firmly planted to the right of every home entry. 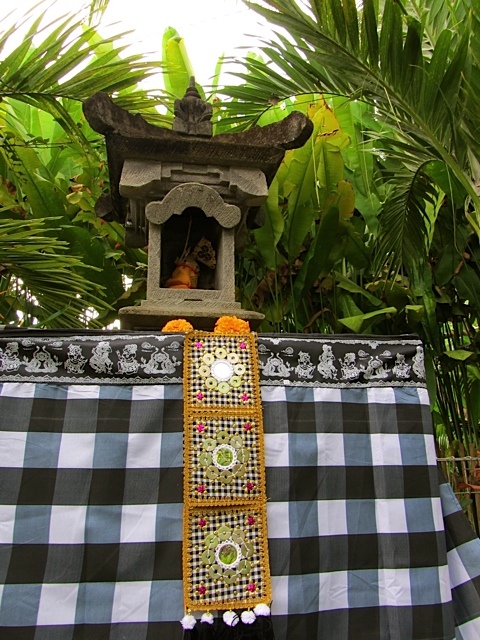 At each gate, you’ll also find small bamboo altars set up especially for the holiday, each one bearing woven palm-leaf offerings for the spirits. 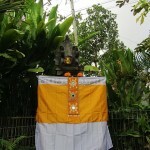 This is the most important holiday symbolizing the victory of Virtue (Dharma) over Evil (Adharma). 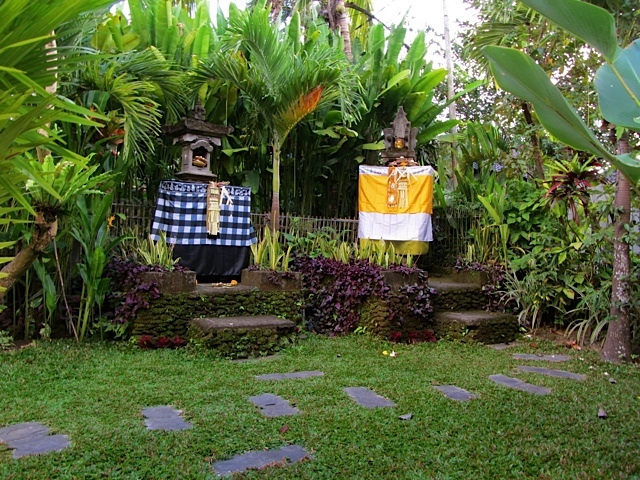 There are black and white checkered cloths everywhere, representing the duality of good and evil. 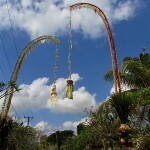 Three days of preparation are needed to prepare for the festivities. 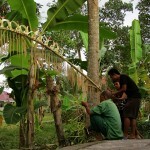 On the first day, bananas are picked or bought so they will be ripe for Galungan. Tape, a mildly alcoholic fermented black rice pudding is also prepared. 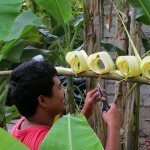 And the mind is stilled, so as not to be disrupted by active spirits. The second day cakes are made. 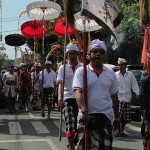 The third day is the slaughter of the animals. 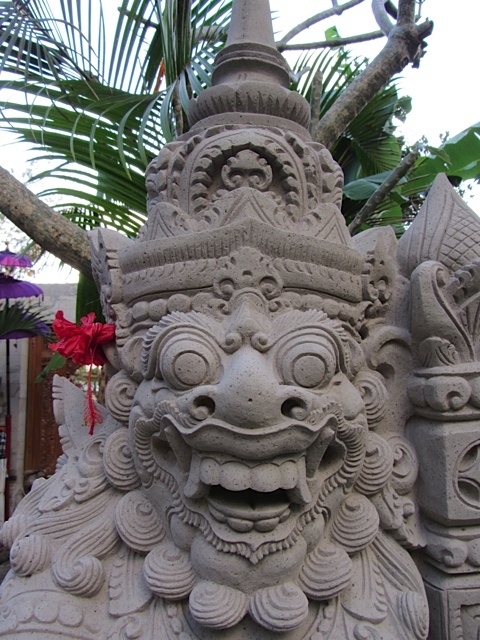 The meat is minced and mixed with herbs and spices to create a satay. 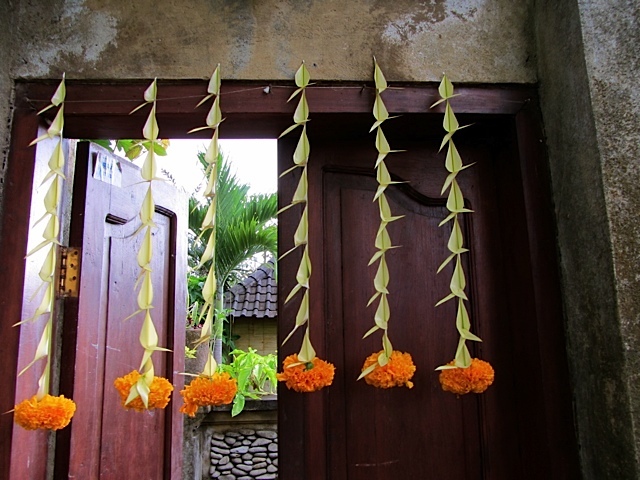 Families offer bountiful sacrifices of food and flowers to the ancestral spirits, expressing gratitude and hopes for protection. 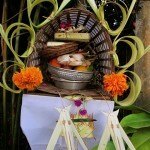 Ketut, the owner of our home, brought in several basket fulls of offerings which included fruit, rice cakes, cakes, nuts, tape and satay. 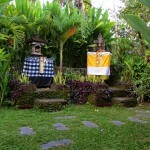 There is spirit and graciousness on this island. 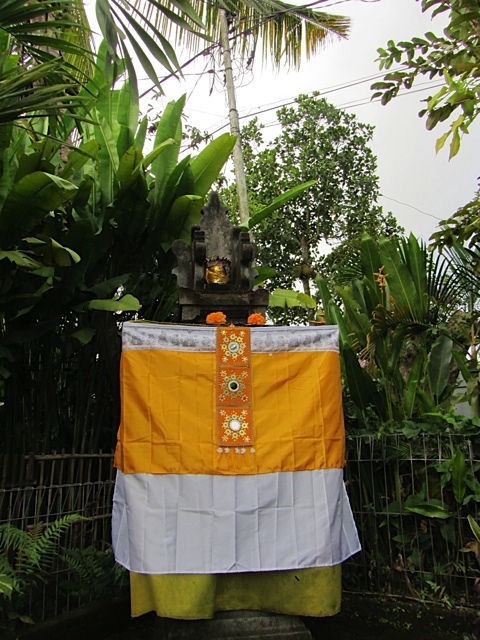 The offerings are a necessary reminder of the connection to the spiritual and ancestral world. 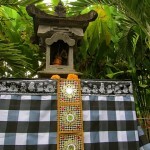 On the day itself, prayers and offerings are made. 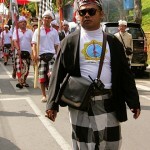 People adorn themselves with the finest of cloths and jewels. 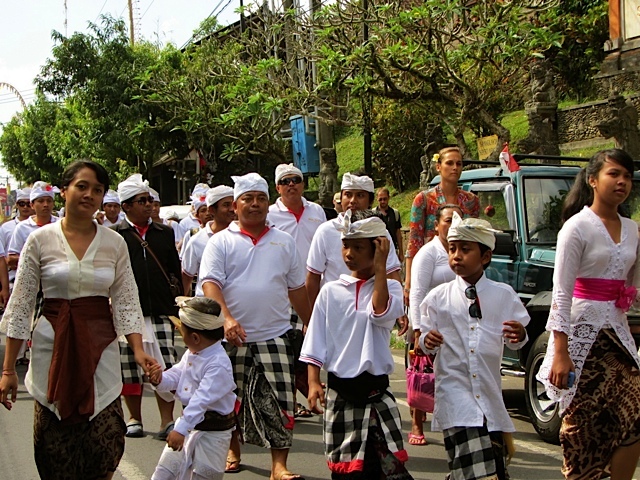 Men are in white tops with a traditional white head piece and women wear lacy, long sleeved tops in jewel colors with sarongs. 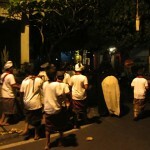 Barongs dance in the street. 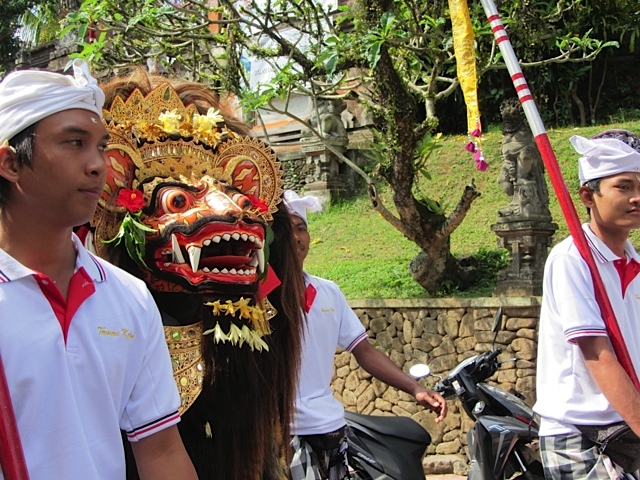 Barongs are lion-like creatures in Bali mythology that are the kings of the good spirits. 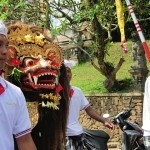 The dance represents the eternal battle of good and evil. 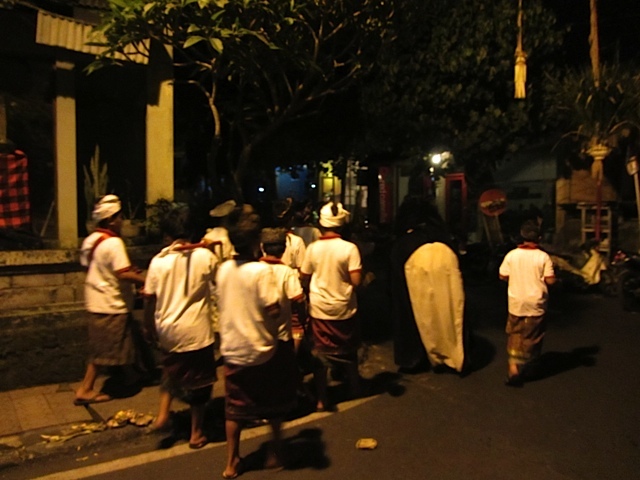 We ventured out at night to see the Barong dances.The streets of Ubud were empty, as most Balinese are at home celebrating with their family. 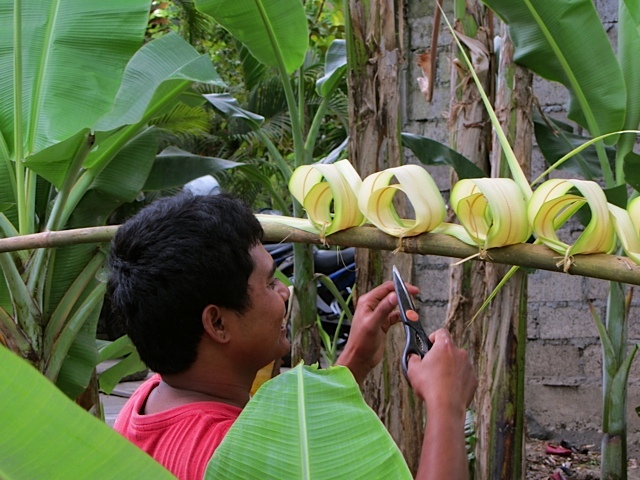 We rode our motorbike to find Barongs. 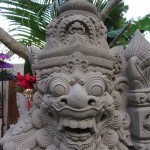 Barong, freaking G out! He’s friendly. Right? 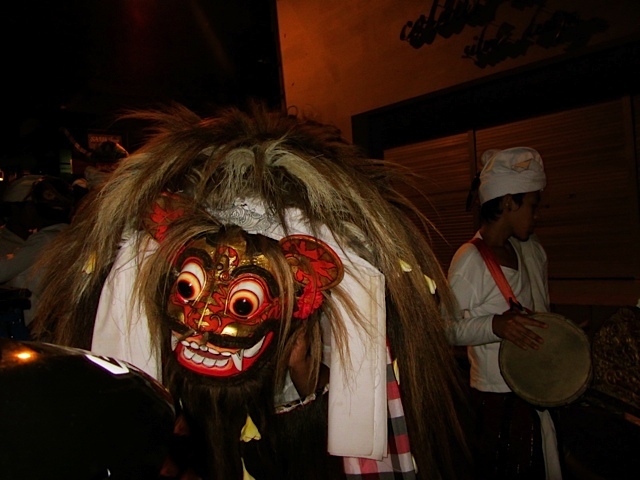 For an offering (donation), the Barong dances for you. 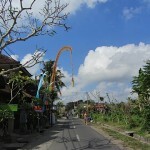 It such a wonderful time to be here on the island of Bali. 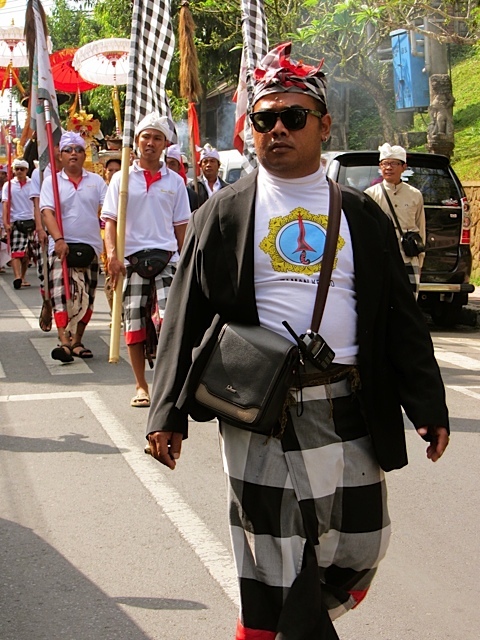 That sums up what I know about Galungan. 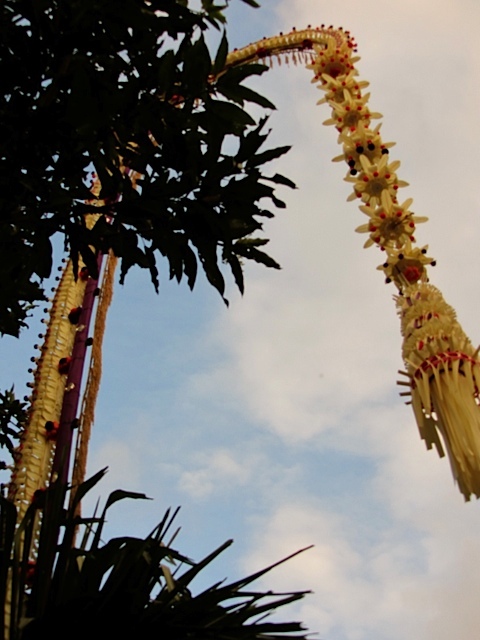 I’ll enjoy playing with the gods for the next 10 days and hope that they bless our family with good and happiness. 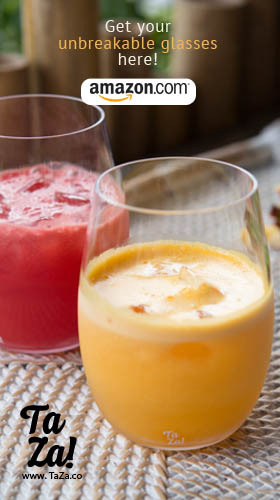 Wow that looks incredible. 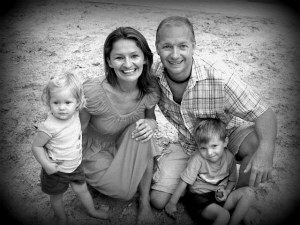 What did your two kids think of the celebrations? 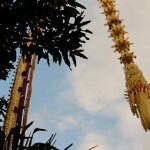 Love the idea of offering gifts to the gods, and having good things happen. Sounds almost like a xmas party but on a larger scale. 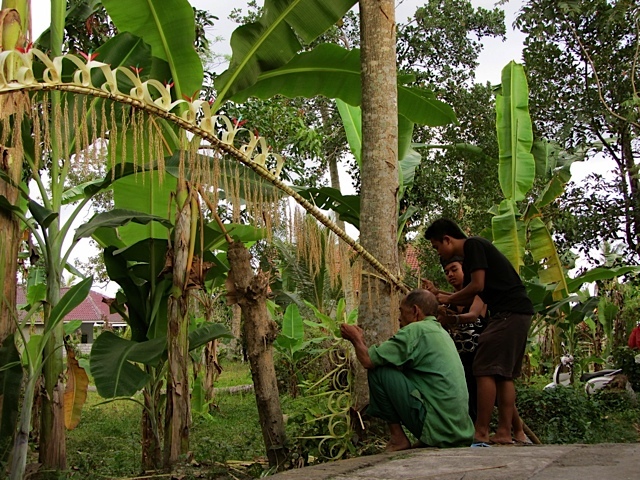 Incredible photos of the Barongs! 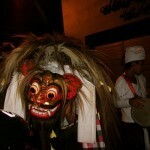 G was a little freaked out by the night Barong dance. As you can see, the creature is frightening. Miss I thinks it’s cool. 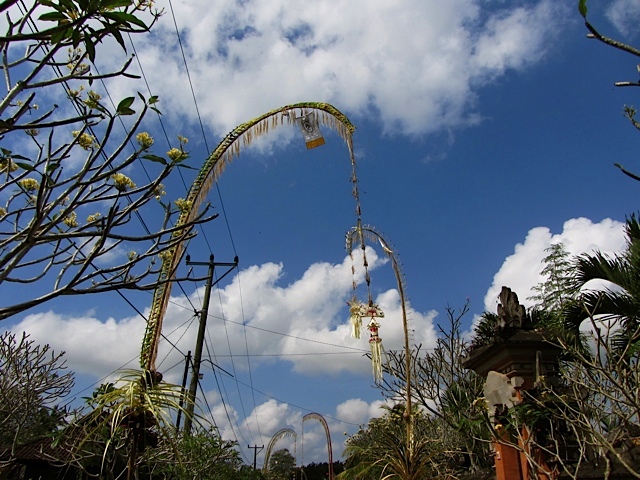 We have been giving thanks and doing our own offerings by sticking incense in the ground to give thanks to Mother Earth and Father Sun, our family and friends, the flowers and trees. I love to hear my kids be thankful for these things and love how they express them. “Thank you for the trees and shade” “Thank you for our pool” “Thank you for the flowers and all the colors” It’s cute. 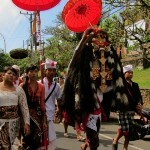 I love the rich culture of Bali. 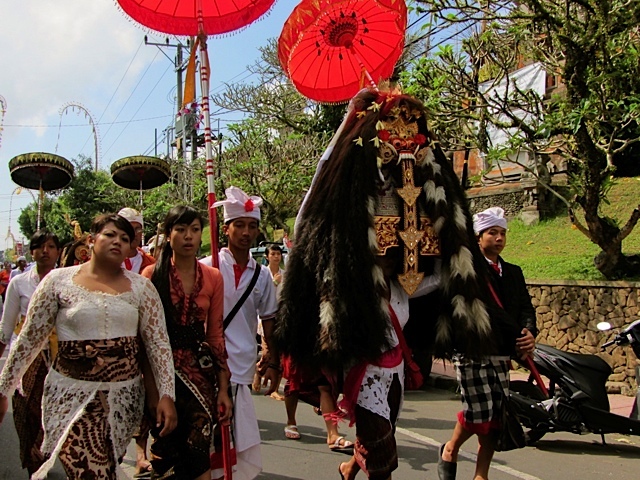 The Barong dance was one of my favourites! 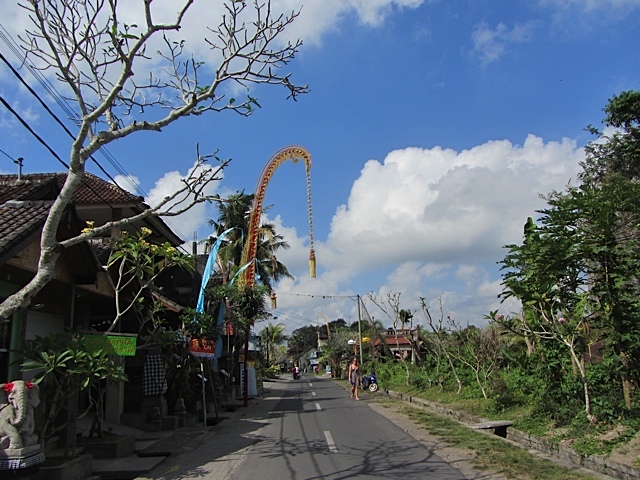 I think some time in Bali might be in our future.